...A new plant. Despite having denied it in a previous post, I am suffering from a slight case of plant burnout. In this case, I'm slightly overwhelmed by the number of plants that are needing extra attention. My luck in keeping my Hedera helix plants free from spider mites has run out, the Coleus Experiment is not going particularly well, (I am down to four plants, none of which are looking all that good) and I have just recently gotten a plague of fungus gnats back down to manageable amounts. But I have been looking for a Vriesea splendens forever, and today I found one at the supermarket. So of course it came home with me, triple-bagged against the cold. Let's hope it doesn't add to my malaise; my record with Bromeliads (except for Tillandsia Air Plants) has been abysmal. I have yet to keep one for more than six months. nooo, don't have malaise. Your posts make me happy and motivated, along with the plants are the strangest people blog. Also, you made me want loads of hedera helix. I'm not sure whether to fear for your plant or not. What were the other bromeliads? If one of them was an Aechmea fasciata, I'll light a candle for your Vriesea tonight. Don't worry screaminggreenconure; I tend to snap out of it pretty quickly. I never lose my love for plants. 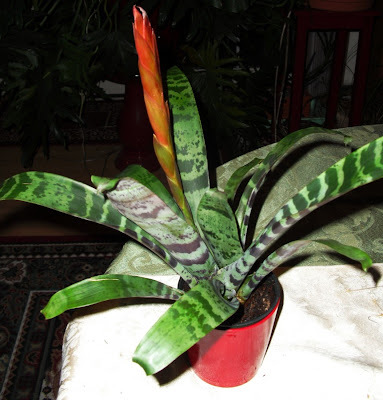 Mr. S: None of them were Aechmea fasciata, but light a candle anyway. Two were Guzmanias, and I never found out what the third was. That was pre-internet, and the plant wasn't in any of my books. In hindsight, it might have been some sort of Vriesea though, so I'm kind of worried. I may have to light two candles. Good luck, Vriesea! We're all rooting for you. No pun intended.